Now that we are (allegedly) moving into warmer weather, I've started thinking about a summer wardrobe for Maia. Shirred dresses and tops are perfect because the elasticity of the bodice ensures an easy transition from a dress to a top over several years and they also look really cute layered over warmer clothes too. Which is just as well, because she will never, ever wear it unlayered in Scotland. And the best bit (customers avert eyes), they're deceptively easy and quick to make. Right sides facing, sew your raw edges together, forming a tube. Roll hem or foldover hem both the top and bottom edges. To make your straps, cut four strips approx 1.5 inches wide. I like my tie straps long because I think it's not as busy at the shoulders, so the length I use is 22 inches each. With an iron, press each strap in half lengthways and then each edge in towards the centre fold. Then fold in half and press again. Sew close to the edge. If you want to save even more time (I think these straps take longer to make than the actual dress), use pre-made binding or ribbon. Hand wind a bobbin with shirring elastic, stretching slightly while winding (but not pulling tight). Put your bobbin into your machine as you would any thread. 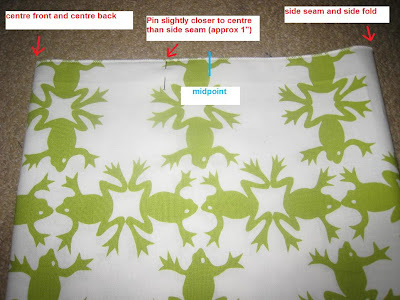 Set your stitch length to long (I use 5 for medium weight fabric like quilters cotton or thicker knits and 4 for thin fabrics like lawn and lightweight jerseys). Starting at the side seam, line up your foot with the top edge of the tube. Front stitch and back stitch a couple times to secure the end. I use a stitch that automatically front and back stitches but you can use a normal straight stitch too. At the side seam where your first revolution is complete, lift your foot and slide the tube down. It's easier to line up your foot edge with your first line of shirring to guide you in a straight line but if you have a good eye for widths and straight lines choose any width you want! The completely miniscule red arrow in the picture below shows how the repositioning looks. 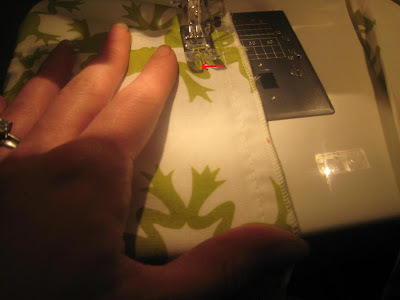 Using your thumb like the picture above, keep the fabric taut and unstretched as you sew your second revolution. At the starting point at the side seam, lift your foot up and slide down again. 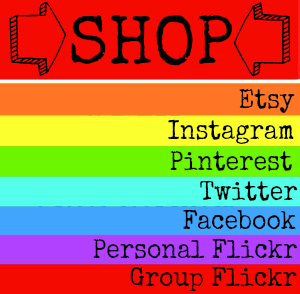 Repeat this as many times as you like, for tops I usually do four or five times and for dresses eight or nine. Keep an eye on how much elastic is left in your bobbin, it's easier to change it before you need to at the side seam than have it run out surprisingly right in the middle. For a dress you'll probably need two bobbins. Remember that you will have to front and back stitch whenever you start or finish a new bobbin. Alternatively, you can leave your ends long and securely knot them together. 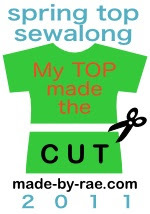 Each new line of shirring will pull the whole bodice in tighter, meaning that you will probably have to use two hands to keep your fabric taut as you sew. Try to ignore how my hands look like flippers. After you have completed as many lines of shirring as you'd like, front and back stitch to finish. Clean up all your loose threads. I tie the end of each strap into a little knot. If your shirring is too loose, blast with steam from the iron, it's amazing how much it will tighten the elastic and draw the bodice in. You do make it look easy! Thanks for the great tutorial. 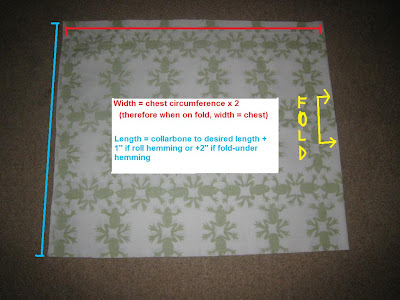 I have been sewing for years and I would never have attempted shirring...I am going to try this :) You make it look pretty straightforward. Thanks! Oh, and I ordered your Asymetrical Jacket pattern...can't wait to give that a try...I'll post pics on your flickr group when I'm done. And I do love the look of these scrunchy topped dresses on wee tummies. It really is easy, I promise! @Jennifer: can't wait to see what you make! Amanda, a question... do I backstitch and frontstitch at the end of each go round? or do i just leave the thread intact and reposition? Hi Jennifer, if you leave the thread intact and reposition you don't need to front and backstitch at each row, just when you start and finish a new bobbin! Thank you very much for sharing this with as. You are very thorough, but I still find the process too difficult for me. I have always wanted to have a go at that, thanks I'll try it out, you make it look easy???? OK - possibly (probably!) asking a stupid question here but the lower bobbin is wound with elastic, yes? Is the upper bobbin which threads through the needle also shirring elastic or just regular thread? @Vonnie: No, not a stupid question at all! The lower bobbin is hand wound with shirring elastic and the upper thread (threaded through the machine) is just normal thread. The shirring elastic in the bobbin pulls in the whole thing as it's being stretched when sewn. I popped in via Vonnie from Blottedcopybook. WOW. 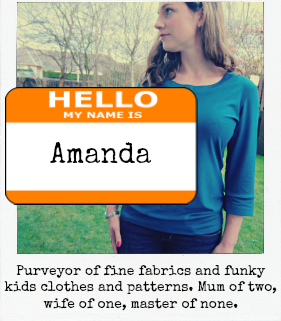 This is a FANTASTIC tute and I look forward to trying it out!!! I am in love with this dress! Sooo pretty.. Tutorials really help to get me trying to learn something new. THX so much. Granddaughter just starting to "bloom", needed something stretchy on top. Brilliant! Who needs bowls when you've got boots? Is it wrong to say I rock? Why are my children so camp?! Let's get stigmatised! Or not. I've been featured in a proper magazine!